We can make anything! If you don't see an item you're looking for, please contact us! Fastbrakes will ship to non USA addresses by DHL. Customers will be responsible for all duties and taxes on the shipments. Fastbrakes designed 13" 6 piston kit using a 2 piece rotor. This kit contains the 13" slotted rotors, 6 piston Wilwood Superlite calipers, performance brake pads, adapter brackets and the front braided steel brake lines. Black calipers standard, Red calipers available at no extra cost, specify when ordering. 13" 4 piston kit using a 2 piece rotor. This kit contains the 13" slotted rotors, 4 piston Wilwood Superlite calipers, performance brake pads, adapter brackets and the front braided steel brake lines. Slotted & drilled rotors available. Grey calipers standard, Black or Red calipers available. Fastbrakes designed 13" 4 piston kit using a 2 piece rotor. This kit contains the 13" slotted rotors, 4 piston Wilwood Superlite calipers WITH DUST SEALS, performance brake pads, adapter brackets and the front braided steel brake lines. Red calipers avaialable. Slotted & drilled rotors available. New larger rotor kit! Fastbrakes 11.75" front 4 piston AP Racing caliper kit for the 1990-2001 Integra. 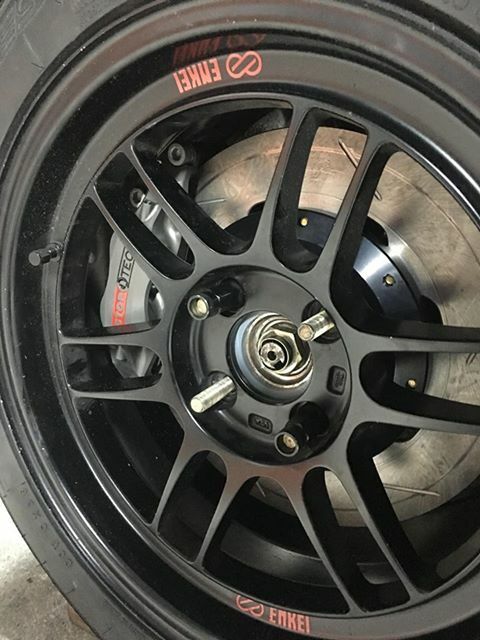 Kit includes the AP Racing radial mount 4 piston calipers with brackets, slotted 11.75" 2 piece rotors, mounting brackets with hardware, performance brake pads, and front braided steel brake lines. Requires at least 15" wheels.